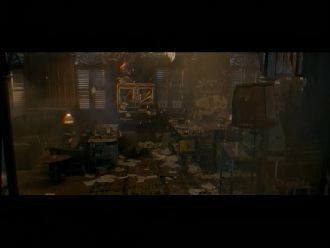 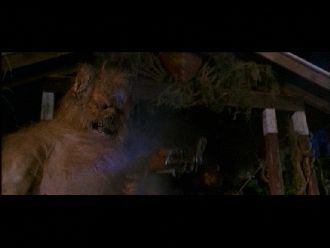 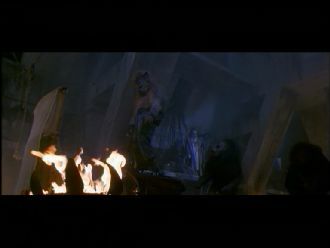 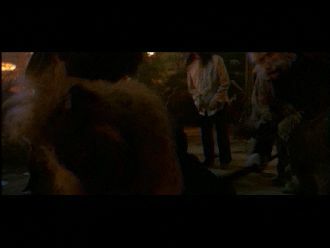 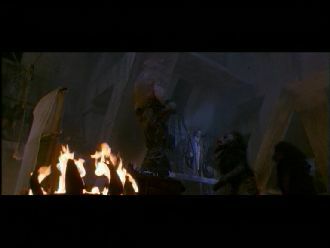 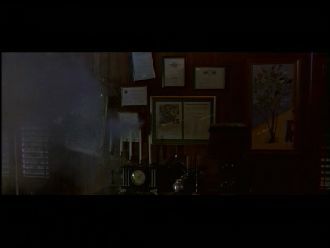 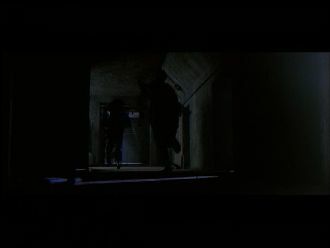 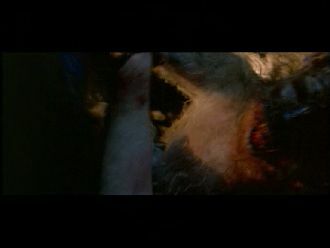 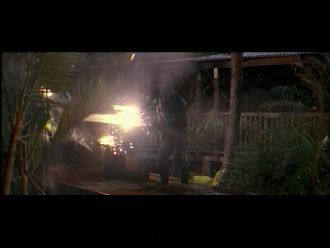 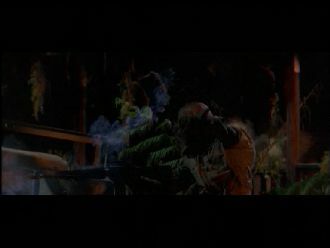 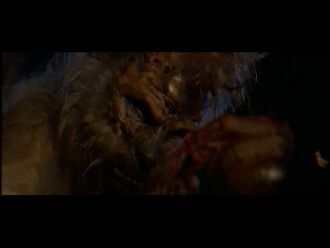 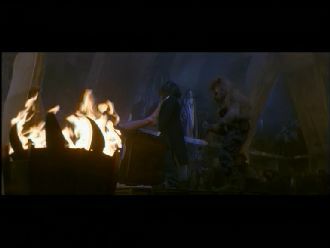 Comparison between the PG-13 VHS by New Line Home Video and the Director's Cut taken from the FSK 16 DVD by VCL / MAWA. 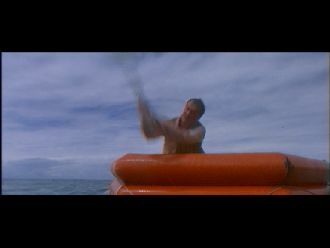 12 cuts = 3 minutes and 27,5 seconds. 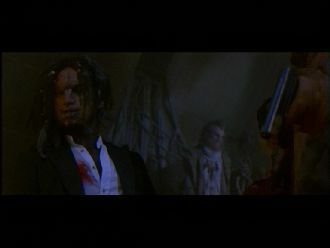 4 alternative scenes = 1 minute and 18,5 seconds. 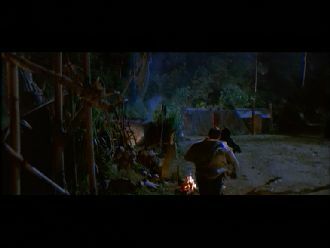 2 alternative scenes without time difference. 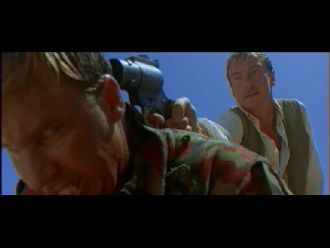 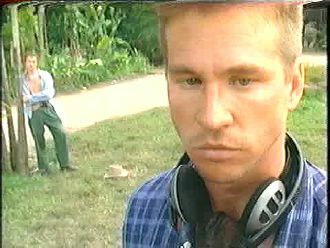 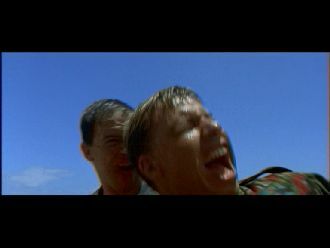 In the US, this really good movie starring Marlon Brando and Val Kilmer was shown in a cut PG-13 version in cinemas. 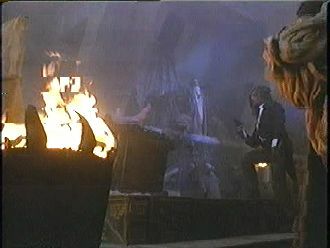 This version was later also released on VHS by New Line Home Video, also with a PG-13 rating. 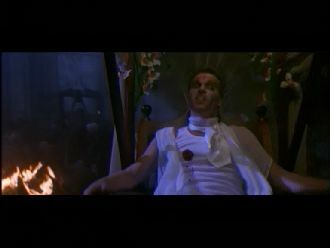 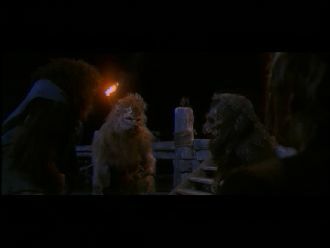 However, they also released the completely uncut Director's Cut of the movie on both VHS, DVD and Blu-Ray. 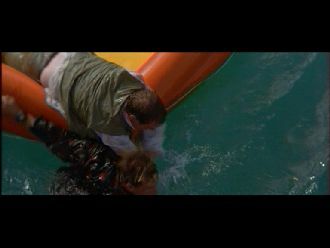 The guy in the rubber raft hits his opponent in the face. 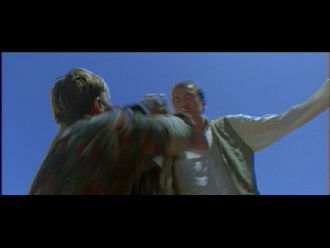 The two guys continue to brawl. 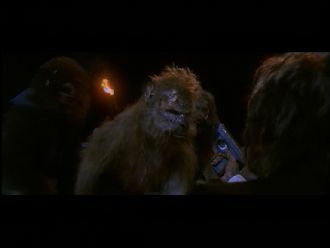 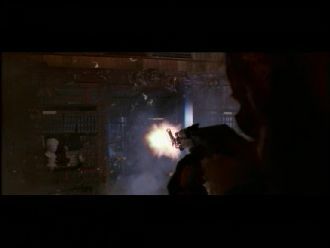 Edward comes and puts his pistol to one of the guys who is just about to choke the other one. 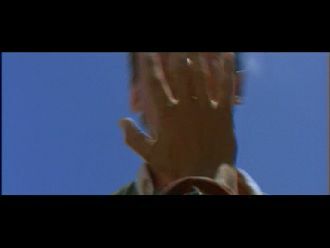 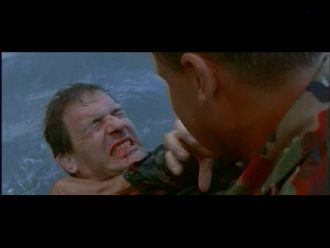 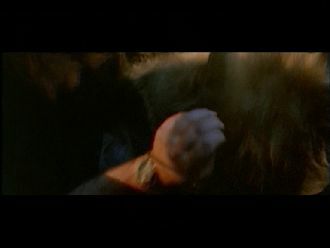 Edward gets a fist in the face and stumbles backwards. 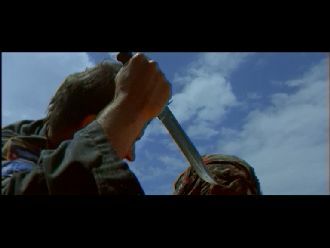 The man who was just being strangled pulls a knife and stabs the other one in the back, however, he is not not impressed, pulls it out again and stabs the other guy in the belly. 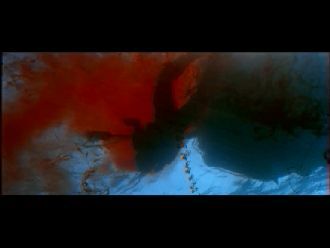 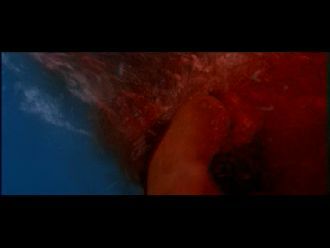 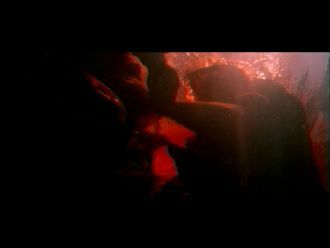 The two can now be seen fighting in the water, which is becoming red from their blood. 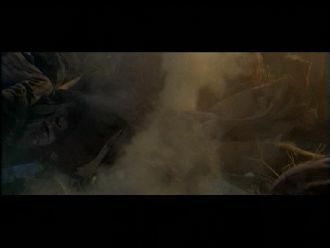 The fight is a bit longer again. 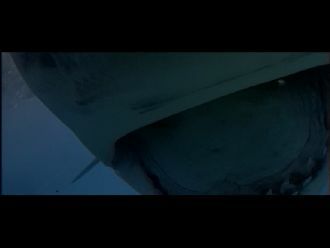 One of the guys is being eaten by the shark. 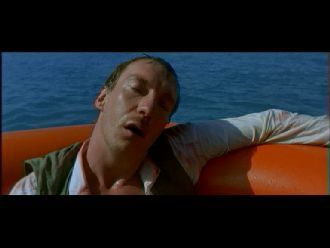 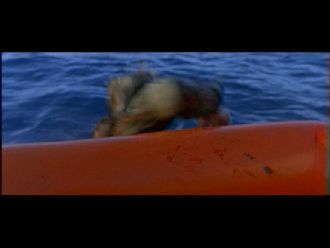 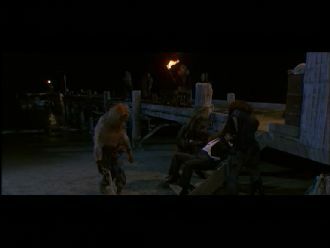 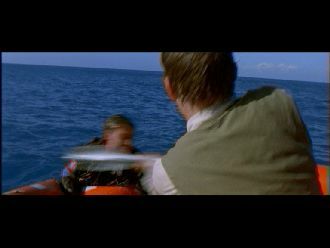 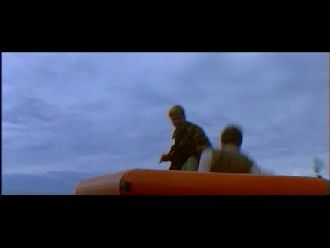 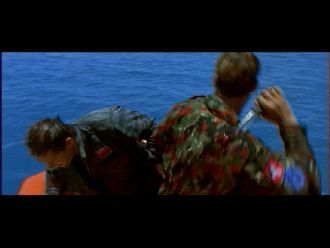 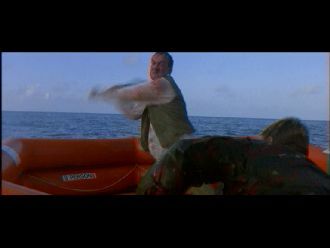 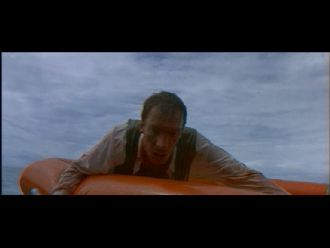 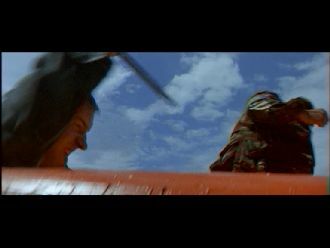 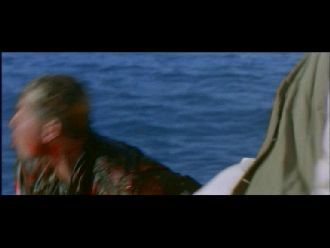 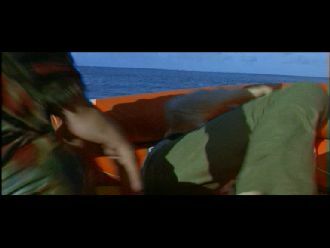 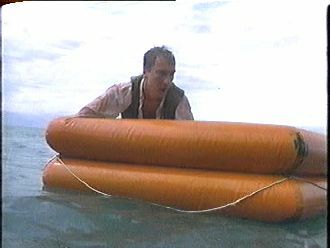 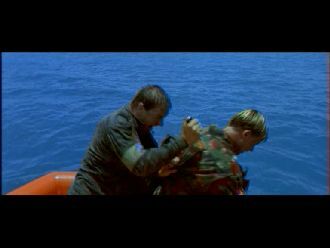 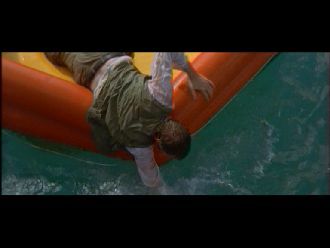 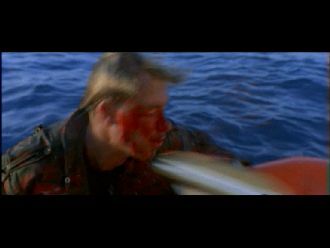 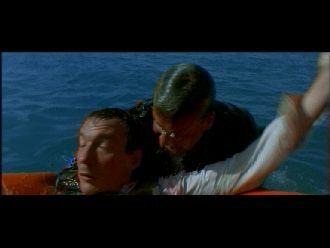 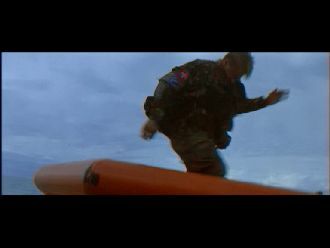 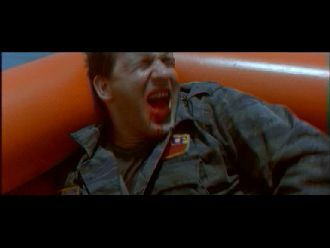 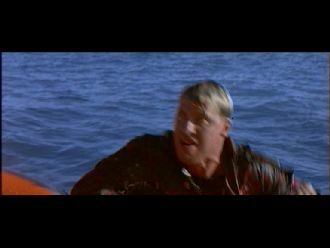 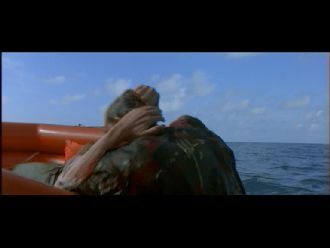 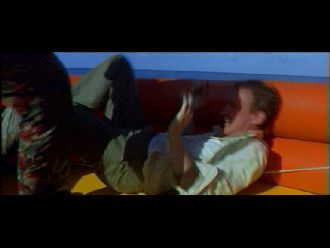 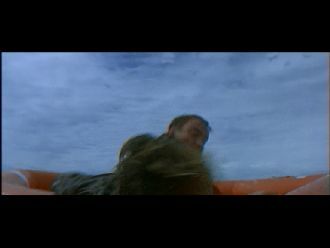 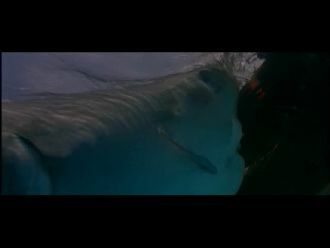 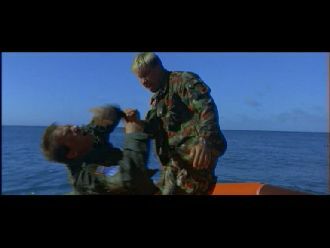 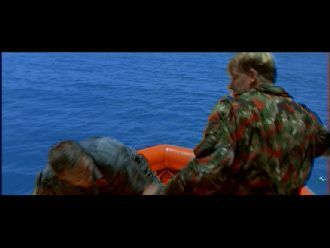 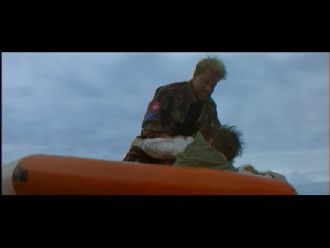 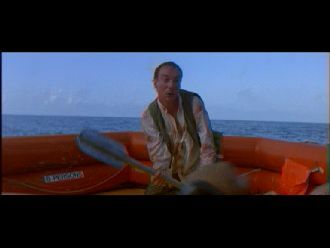 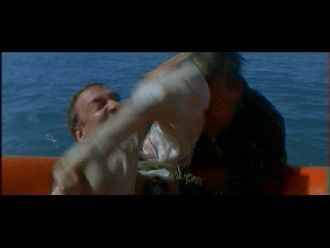 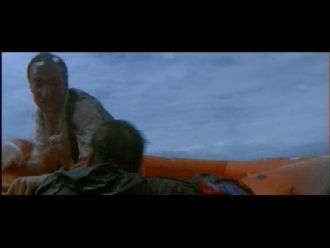 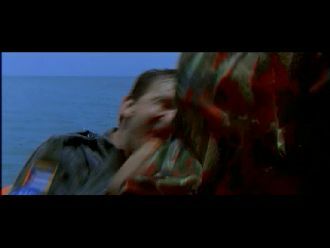 The other one gets out of the water and attacks Edward (still in the raft), who hits him with the paddle until he is floating lifelessly on the water. 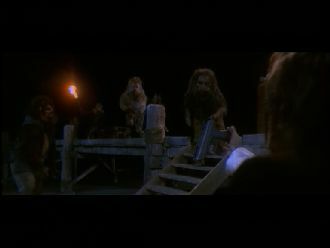 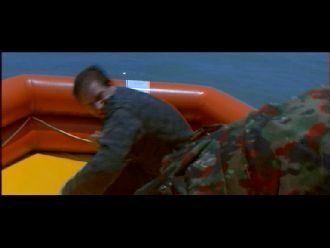 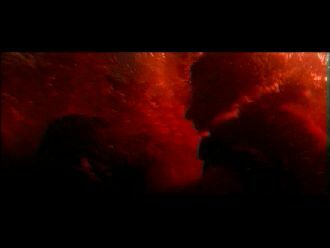 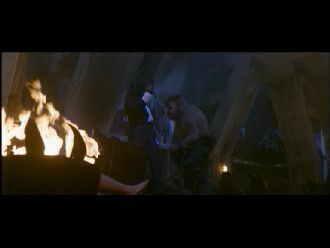 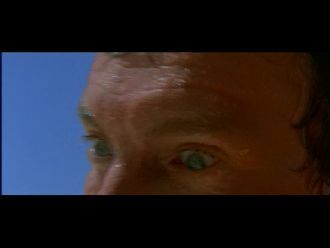 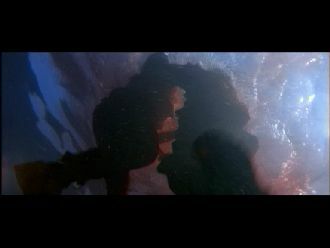 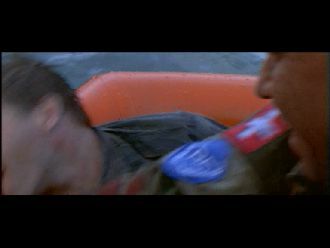 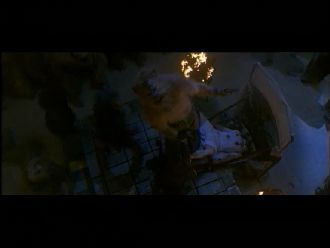 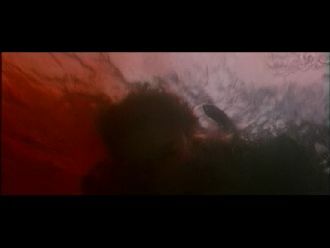 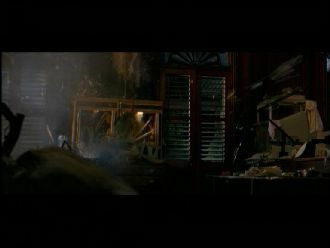 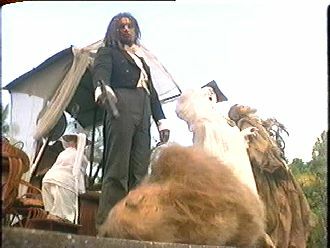 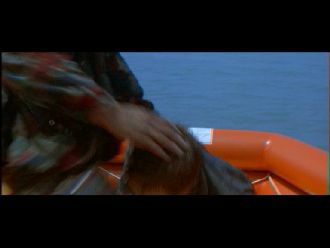 The PG-13 cut only shows Edward sitting in the boat looking at the water surface. 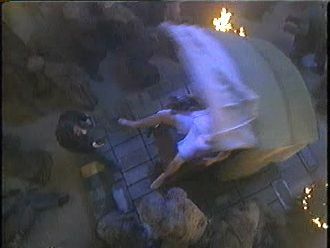 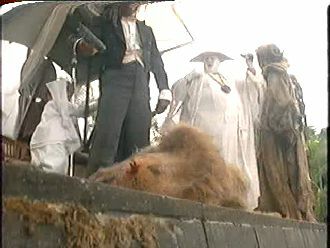 Lo-Mai is hit with an arrow in the head, his body falls to the ground. 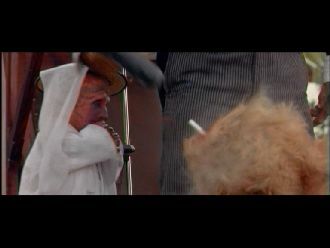 The PG-13 shows harmless alternative material instead. 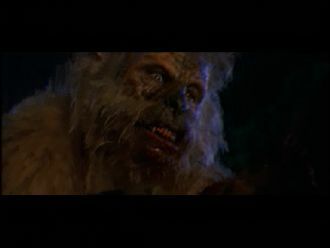 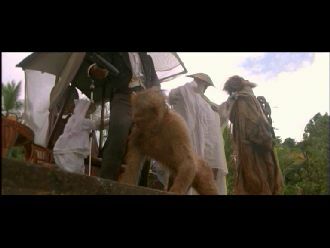 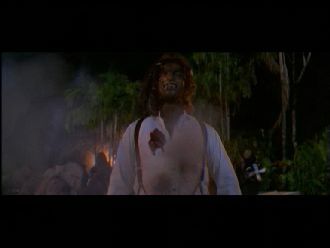 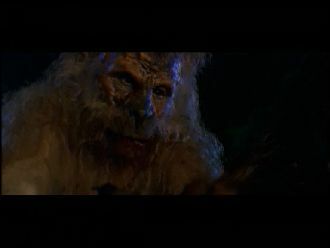 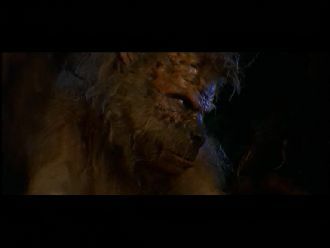 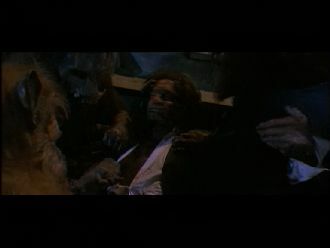 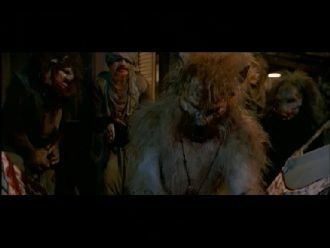 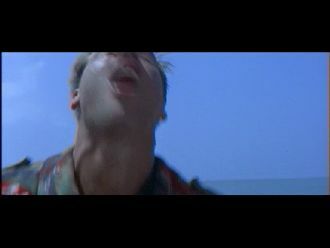 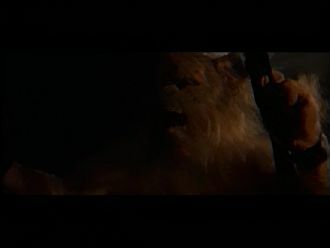 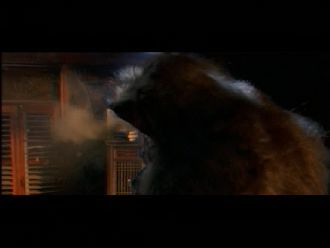 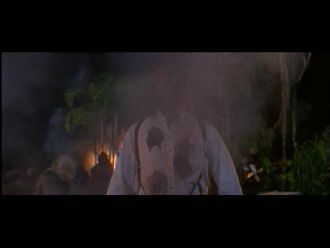 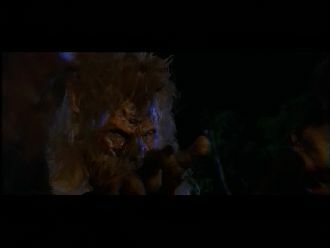 Hyena bites into Moreau's shoulder. 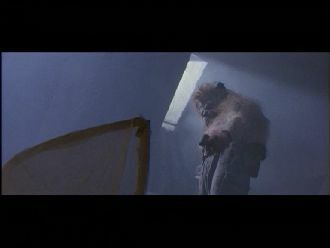 Hyena can be seen attacking him longer. 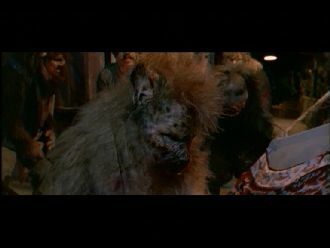 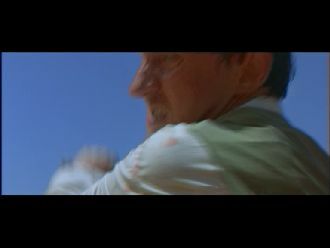 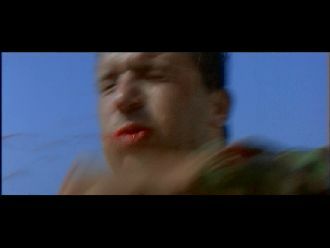 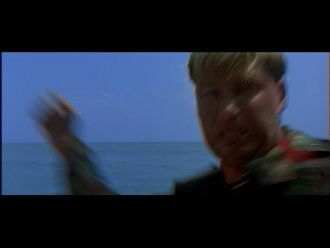 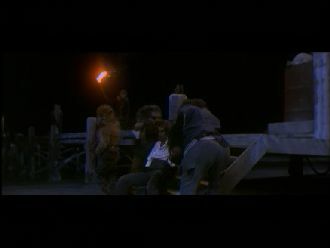 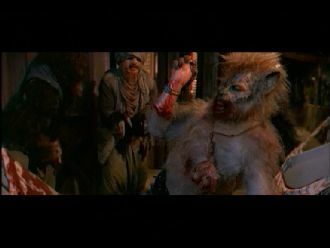 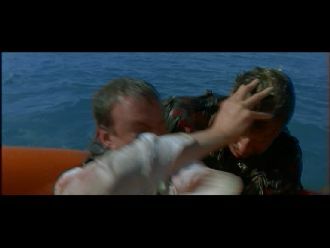 Again more violence against Moreau, Hyena also tears his arm off. 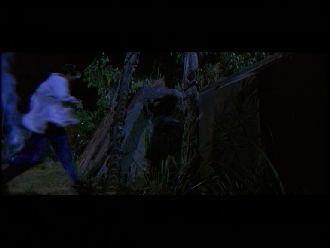 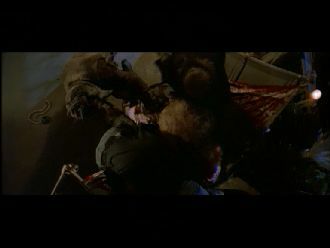 Hyena lets go offf Moreau's corpse, this is seen from further away in the cut version. 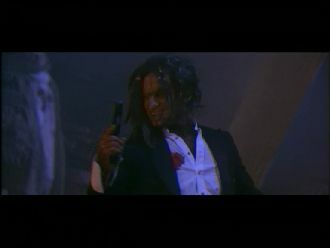 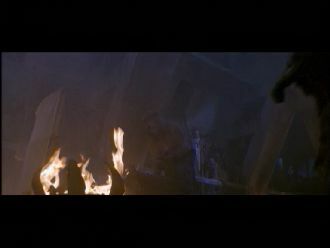 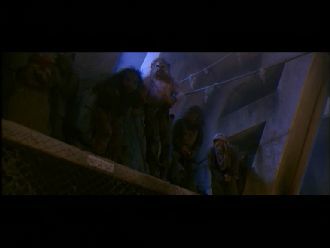 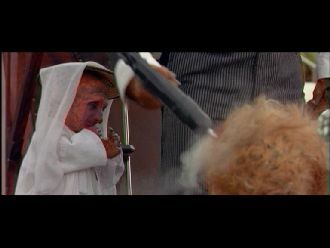 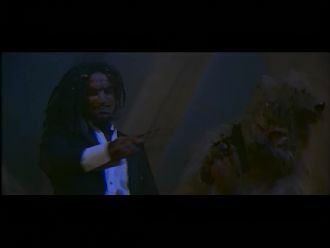 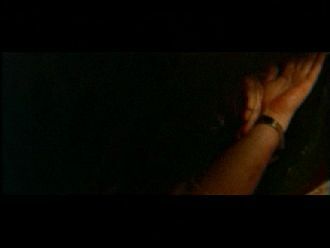 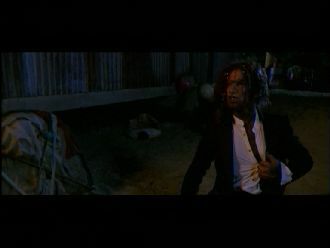 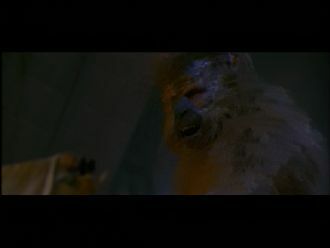 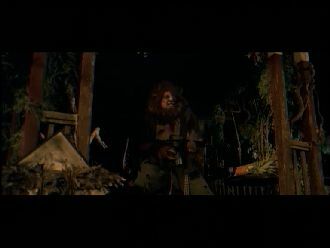 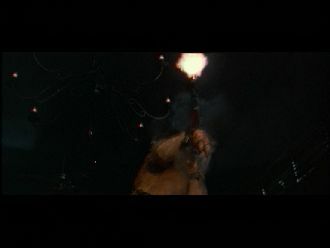 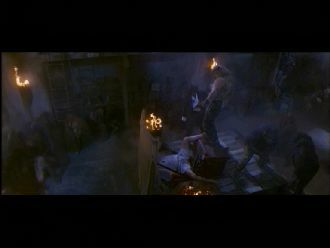 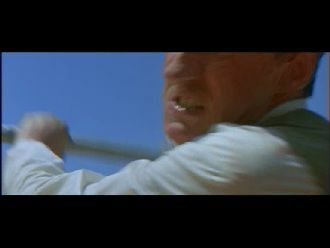 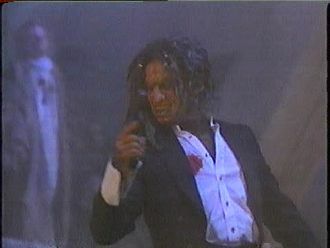 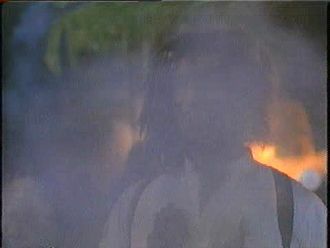 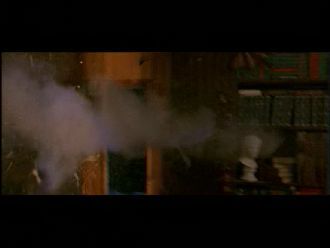 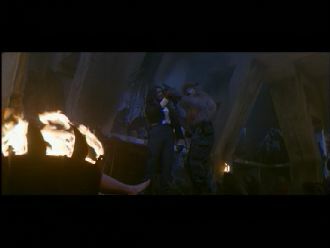 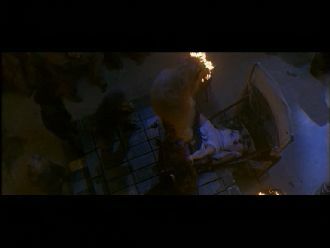 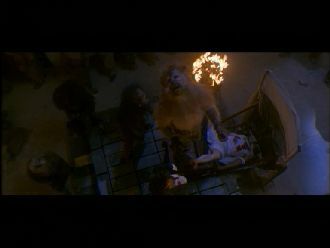 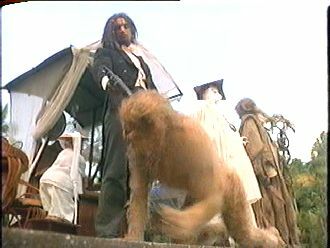 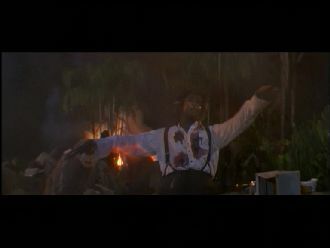 After Edward fired a shot, Hyena throws the severed arm away. 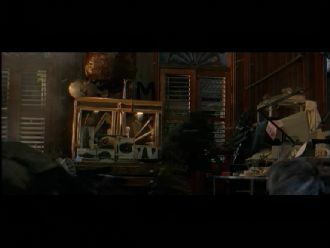 The PG-13 shows alternative material again. 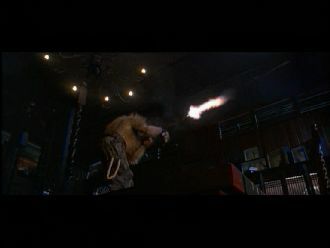 Assassimon gives Hyena the gun and adds that he knows where more weapons can be found. 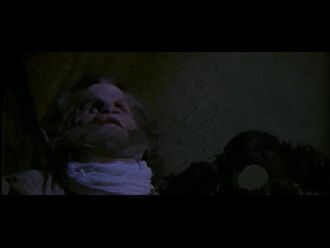 In return for telling her his secret he wants his implant removed. 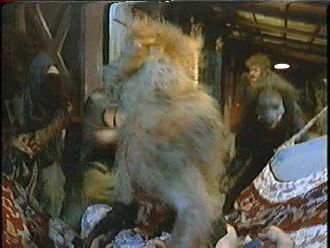 He is then grabbed by the others and Hyena tears the implant out of his body. 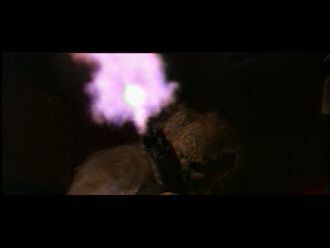 Montgomery is being shot by Assassimon. 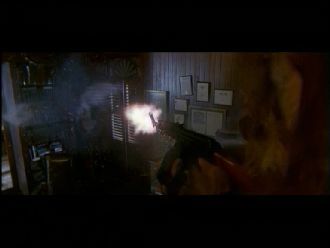 Hyena jumps down, receives the gun from Assassimon and also shoots at the already dead Montgomery. 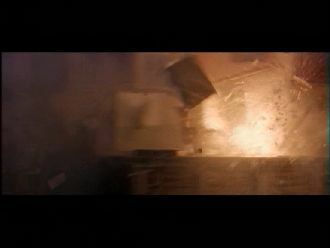 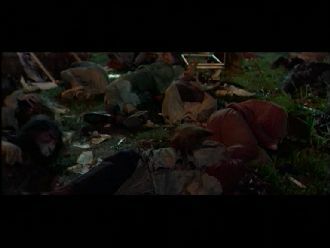 The PG-13 shows some alternative footage for the killing of Montgomery again. 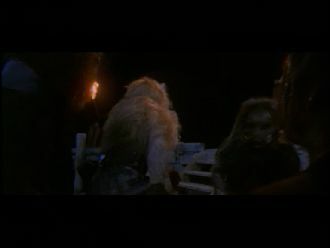 Edward and Aissa walk along the way and enter the base. 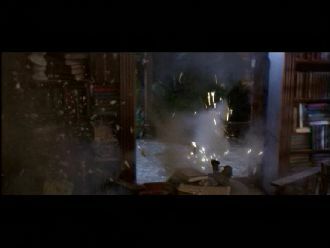 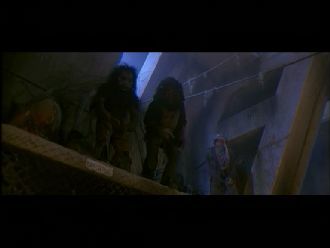 In the meantime, Hyena is shooting around in the room and destroys the whole inventory in the process. 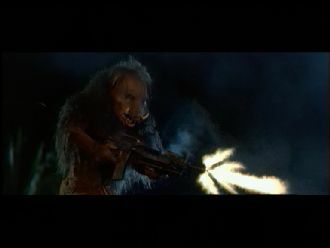 Assassimon is being shot by Hyena in three different perspectives. 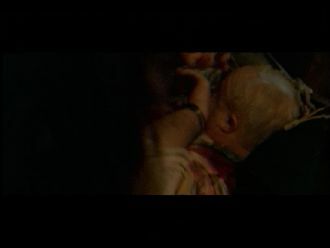 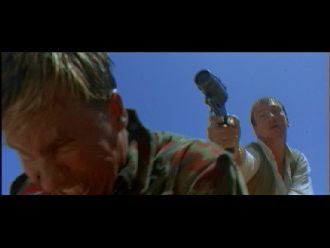 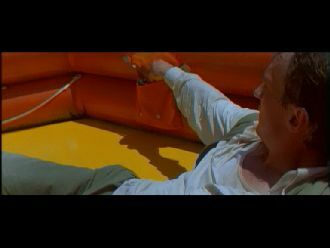 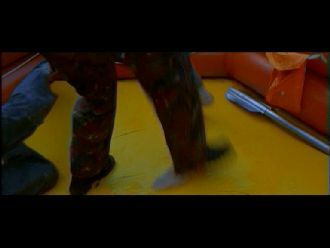 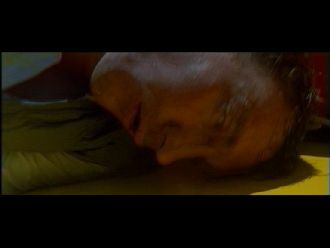 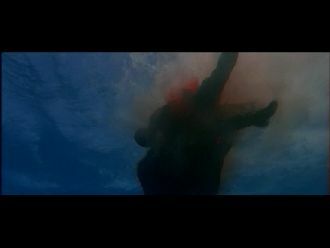 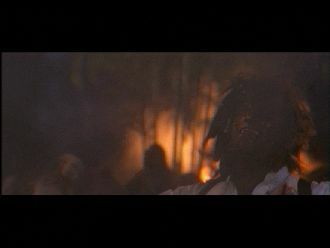 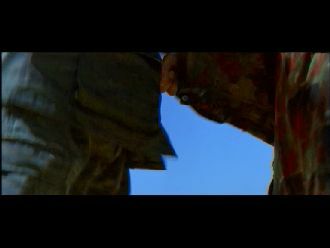 The PG-13 only shows on of these shots, it is also zoomed in so the bullet wounds cannot be seen. 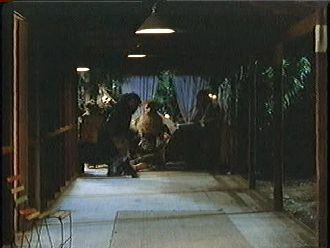 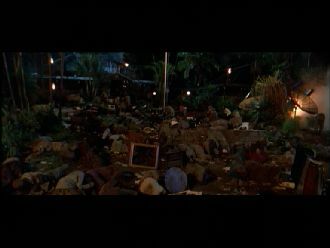 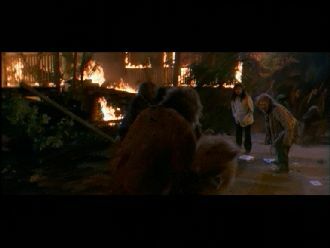 The inhabitants of the island are spasming on the ground (due to the electronic shocks they received). 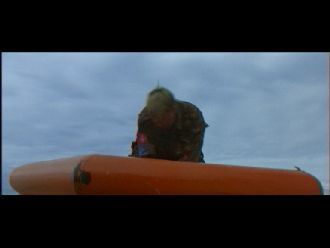 Another shot of the former is missing. 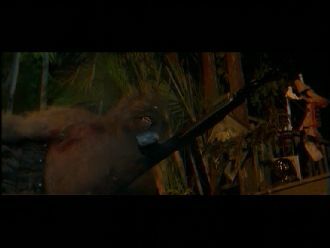 The island inhabitants are being shot at. 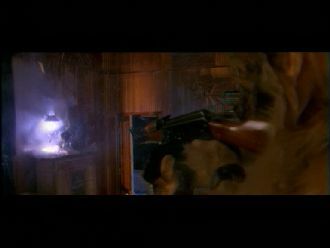 Hyena shoots at the gunman who wounded him before. 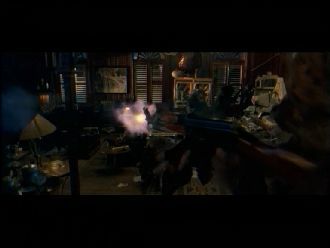 The gunman is being hit by several bullets. 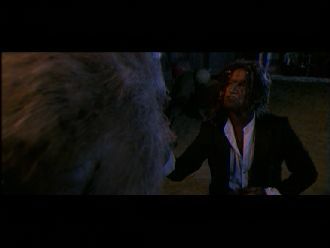 Hyena is being beaten longer.